It was far from a vintage weekend for the various Carniny Youth sides involved in a largely disappointing sequence of results. The other U10s lost out to Maiden City by a single goal as did the U11s to Hillsborough. In the National League both the 13s and 15s lost their respective games with the Under 14s suffering heartache in the National league Plate going out to Oxford Utd after extra time. The Under17s were on the wrong side of a 2-1 scoreline on Friday night losing the ‘mini derby’ to BUFC YA. The club will be holding a fundraising event, a ‘Night at the Races’ on Saturday 21st March at Michelin Athletic Club, Woodside Road, Ballymena. Horses are available for purchase from all team staff members. The night is open to all, parents, coaches, friends and supporters. There will be an adults disco after the Races. The club congratulates former player Matthew Shevlin who has been included in The Irish Football Association N Ireland Under 17 squad for the forthcoming UEFA Mini Elite tournament in Holland. Carniny Youth 2, Maiden City 3: Maiden city took the lead on the counter attack. This shocked Carniny and they went to sleep from the kick off and city raced through and went two up. The second half saw Carniny playing with the wind and McMullan sent Moody free down the left and this time his hard work was rewarded with an unstoppable shot flying into the bottom corner of the net. This inspired Carniny and a through ball from Murray sent Kennedy through and he beat his marker and slotted the ball past the keeper to make it 2-2. There only looked like one winner now but Moody hit the post and McMullan hit the bar before City scored their third with a goal worthy of winning any game. Carniny AMatuers 6, Institute 6: A remarkable game which saw Carniny lead 4-1 at one stage before relying on a late Sam Magee free kick to earna draw. 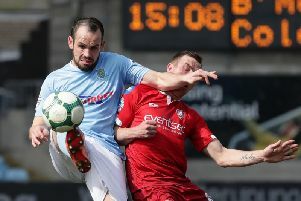 Magee and Leon Graham scored twice apiece, while Cormac McMullan and William Francey were also on target for the Reds. Result: Carniny Youth 1, Hillsborough Colts 2. Carniny Youth 0, Ards Rangers 1: Carniny U12’s were defeated by a single goal in poor weather conditions in Belfast. Ards took the lead from a free kick in the first half and missed a second half penalty, while Carniny almost forced a late equaliser in a goalmouth scramble. Carniny: Cathiness, McMullan, Dennison, Telford, Reid, Pogue, Buick, Gregg, Adger, McGall, Johnston. Carniny Youth 2, Derry Colts 4: Carniny trailed 2-0 at the break, having played against the wind but Aidan Graffin pulled a goal back early in the second half. Derry scored a third but Robinson again cut the gap before the visitors finally settled it with a late fourth. Carniny 2, Oxford United Stars 3 (aet): Carniny battled back from two goals down to level the tie through McKitterick and Cameron Moag. However, with both sides displaying tired legs in extra time, it was Oxford who scored the decisive winning goal. Result: Carniny Youth 1, Ridgeway Rovers 7. Carniny Youth 1, Ballymena United 2: Ballymena opened the scoring from a mistake in the Carniny defence when a short back pass was pounced upon by a Ballymena player who scored with a good finish. Ballymena playing with the wind in the second half were having more possession and increased their lead when from a corner kick one of their players was left unmarked and he finished with a good header. Carniny pulled a goal back when Krystian Jaworski was able to shoot home from close range and Carniny were foiled in their search for an equaliser as Gibson in the Ballymena goal pulled off two more fine saves. Carniny: Marquess, Calderwood, Hart, Webb, McComb, Price, Millar, Jaworski, Johnston, O’Mullan, Balmer, Doherty, Letters, Burns.